1 Currently, militaries effectively leverage academic institutions and resources to build theory and examine military-related topics; an appropriate example would be the work of the Gregg Centre for the Study of War and Society at the University of New Brunswick. However, academia can provide more than just theory. Practical experience in quantitative and qualitative analysis can be used to examine failed states and human security and to improve the effectiveness of non-governmental organization (NGO)-driven intelligence. The analytic capability of NGO intelligence and safety must be strengthened if NGOs are to survive in an increasingly dangerous operational environment; academia provides a non-intrusive approach to improve analysis using remote-access analysis. 3 To begin, the article loosely maps out the threat to NGOs, including the political and financial power of aid, the understanding of aid by criminals and insurgents,4 and the political and cultural threat that NGOs pose to insurgents. 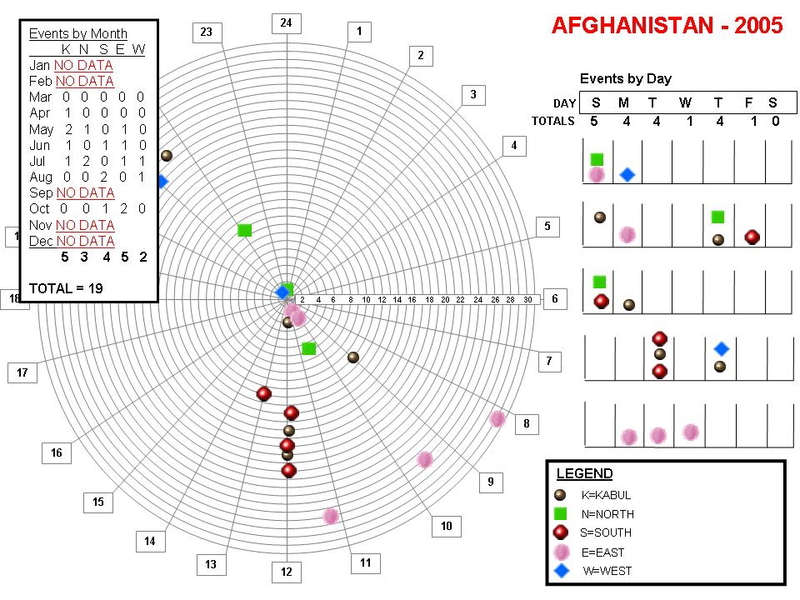 Next, a case study of NGO security incidents in Afghanistan (2005-06) demonstrates the potential for NGO-driven intelligence. The source data is tacit, latent, open-source5 information gleaned from NGO-generated security incident6 reports. Blending traditional intelligence with social science research methods creates an intelligence product that is uncomplicated and does not intrude on NGOs’ operations or security. Due to the nature of their role, NGOs have a plethora of information at their disposal but lack significant analytic capability and are reluctant to share detailed information for analysis with militaries or governments.7 The article concludes with a recommendation for closer relationships between NGOs and academia as a means to increase NGO analytic capacity and quality of intelligence products. Despite NGOs’ significant capability to increase governmental capacity and legitimacy, research into NGO security is in its infancy. 4 Academics have yet to provide one overarching definition of intelligence because of the variety of activities and actors it encompasses.8 In this article, NGO-driven intelligence is defined as the collection, collation, analysis, and dissemination of processed tacit, latent, and open-source information designed to provide NGOs with situational awareness and an understanding of the threat environment. 5 The focus of NGO-driven intelligence is the generation of material that facilitates survival of the NGO and its mandate. The purpose of NGO-driven intelligence is to make intelligence available to NGO decision-makers, providing them with the opportunity to mitigate risk to national and international personnel, material, and equipment. The words, intelligence and even security are rarely used within NGO or UN literature because of their negative connotations.9 “Safety” is the word most commonly used to describe NGO intelligence efforts. Before discussing the improvement of NGO security, it is necessary to establish the risk to NGOs. 8 The nature of NGOs’ work no longer protects them.16 Past security methods, including acceptance practices, may no longer be as effective because the nature of warfare has evolved. David Kilcullen has argued that insurgency is a likely vehicle future opponents can use to bypass conventional military and political power.17 Frank Hoffman has argued that, in this period of extremism, there will be a blurring of war, peace, combatants, and non-combatants in perpetual hybrid war.18 Other participant observers go so far as to assert that humanity is under assault. Even if one disagrees with Hoffman or other analysts, obviously violent conflict has become unrestrained and is comprised of a complex mixture of networked criminality, corruption, religious fundamentalism, ethnic and communal violence, forced mass migration, illegal resource exploitation, and violent competition for life-sustaining resources, such as land and water.19 Non-state violent actors within the conflict will likely be adept at exploiting their environment; proficient in the use of increasingly portable firepower; use enabled electronic communications and be well informed; and effectively combine media, culture, and nationalism to shape the information environment to their benefit. Within unrestrained violent conflict, interconnected threats, such as crime used as a means to fund insurgent efforts, are common. Despite being at risk, NGOs will likely continue to play a prominent role in stability operations. 9 The instability created by a constantly changing threat environment in Afghanistan contributes to NGO insecurity and undermines reconstruction efforts. Threats and security incidents impede the ability of NGOs to access beneficiaries, deliver humanitarian aid, and implement urgently needed reconstruction and development projects.20 For example, during the time period of 22 July-22 August 2009, the Ministry of Rural Rehabilitation and Development’s National Solidarity Programme reported that increased security risks caused the suspension of activities in 1,340 communities in 15 provinces in Afghanistan.21 Effective NGO intelligence assessments may have reduced the number of failed programs by indicating the vulnerability of the security environment, meaning time and resources may have been preserved. 10 NGOs are attacked because they are brokers of valuable commodities in a conflict zone. NGOs operate in an environment that is so complex that Mark Duffield has described it as neo-medieval.22 Within this confused and complex security environment, NGOs are attacked because they provide valuable goods and services, offer some stability, are perceived as providing aid to the government, and are usually culturally different from the population. Whether they realize it or not, NGOs are high-value targets because they are power brokers in the greater security, political, social, and economic landscape. 11 In any insurgency, the people are the prize; therefore, in an insurgent war control over the material that keeps the populace alive means victory.23 NGO power originates from a seemingly limitless supply of humanitarian aid.24 Thus perceived as wealthy, international NGOs are prime targets for theft and extortion by opportunistic individuals or organized crime.25 Consisting of locally valuable commodities, humanitarian aid provides a tempting target to any aggressor, whether criminal or insurgent. It also represents considerable political power. Stolen humanitarian aid can sustain the aggressor; selling the aid becomes a source of income, trade, or means of obtaining weapons; and distributing the aid provides a means to coerce the population, enhancing the aggressor’s political power. 12 To have legitimacy, the Afghan government must have resources for reconstruction, economic development, and infrastructure. The bulk of those resources are administered by foreign NGOs. However, over the centuries, foreigners have repeatedly invaded Afghanistan. Such a history has built resentment toward foreign interference within Pashtu tribes within their state.26 In the eyes of some Afghans, NGOs are morally corrupt and part of a foreign intervention in Afghan affairs.27 The very legitimacy and stability NGOs are attempting to create may be threatened unless resources and development efforts have a palatable Afghan “face” and moral/cultural position. 13 Insurgents, warlords, and criminals may perceive NGOs not just as government supporters but also as representatives of imperialism, neo-colonialism, or at least an alien political agenda. NGOs active with Provincial Reconstruction Teams (PRTs) are associated with intelligence collection. Sippi Azarbaijani-Moghaddam et al. have noted that “Many . . . felt that the Taliban and their spies were suspicious of people who were in regular contact with PRTs.”28 Since many NGOs are based in government administrative centers, NGOs are guilty of collaboration by association.29 Moreover, NGOs serve as a basis for stability by providing the essentials of life while enhancing Afghanistan’s infrastructure. This spreads the government’s authority and legitimacy, eroding the chaos in which insurgents, warlords, and criminals thrive. 15 While both insurgents and government forces struggle for dominance, civilians are likely to be the victims of violence and coercion. NGOs attempting to relieve the suffering of these civilians will themselves likely experience the same violence and coercion as the victims. Worse, the insurgents have targeted NGOs because these organizations provide the most significant means for the average Afghan to gain an understanding of the Western world. The insurgents seek to maintain a gap in understanding to ease their manipulation of the population. 16 NGOs face danger when producing intelligence. Activity in excess of a NGO’s mandate may result in unwanted or unwarranted attention. A database is considered a dangerous effort, but the replacement of anecdotal reporting by a systematic collection and analysis method is required if NGO security is to be improved. 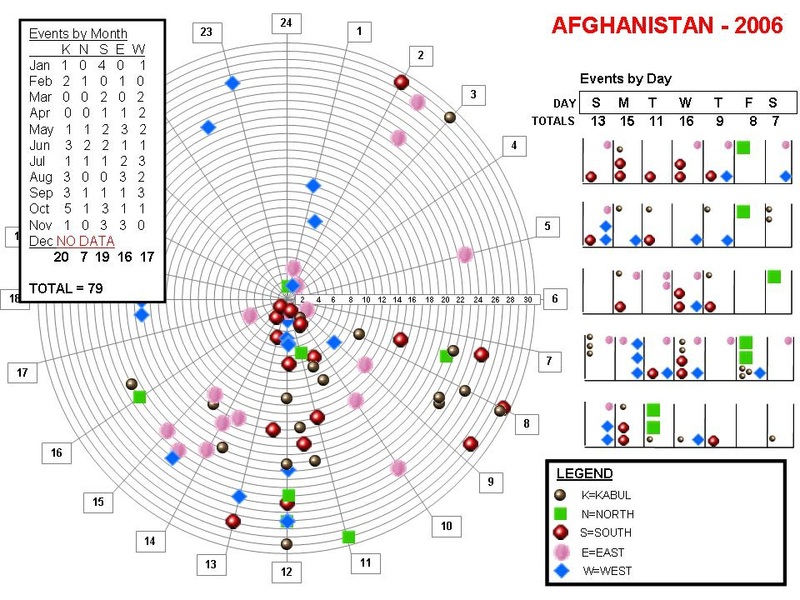 Even simplistic mapping and analysis may be dangerous in certain environments.31 Maintenance of situational awareness and analysis of geographical patterns, ascertained through plotting events on a topographical map, have been used since the mid-nineteenth century.32 Mapping current events, unexploded ordinances (UXOs), safe havens, and conducting route planning may easily be misinterpreted. For instance, in 2007 there were increased reports of insurgents forcibly entering NGO compounds in search of links to NATO.33 Obviously, NGOs operate successfully using local knowledge that requires limited analysis and can be easily explained using local reference points; however, an international NGO conducting long-term planning requires clear, concise, processed information that reaches beyond the local environment. Despite dangers, NGOs must produce intelligence to meet their mandates, and a safer method would see external actors provide and maintain a security-incident database, continuous analysis, and access-added information resources for NGOs. 17 In summary, because insurgency is a political war, those actors, such as NGOs, that provide stability and enhance government legitimacy are natural insurgent targets. NGOs can provide legitimacy and strengthen the authority of governments like the Islamic Republic of Afghanistan (IRA) by providing the political goods and services that the government may not be able to provide.34 Essentially, insurgent attacks on NGOs undermine the political capital of the Canadian military, reconstruction, and political efforts to bring stability to Afghanistan. 18 The concept of NGO-driven intelligence is new35 and very few NGOs specialize in intelligence or situational analysis. Nevertheless, a community of NGOs operating in Afghanistan, realizing their shared vulnerability, formed the Afghanistan NGO Safety Organization (ANSO)36 in 2002. Today, the European Union, Swiss Aid, and the Norwegian government fund ANSO. They have five offices (Kabul, Jalalabad, Herat, Kandahar, and Mazar-I-Sharief) with a staff of almost 50 people. However, ANSO does more training of NGOs than it does analysis.37 Their Kabul office acts as the information focal point. It collects security information from the regional security advisors in each of the five operational regions.38 ANSO is the only focal point for NGO security in Afghanistan. 20 NGO-driven intelligence will not be perfect. But NGOs are a vital part of civil society, affecting human security at a local level, with national and international effect. As a result, NGOs need to generate the means to increase their own security. Threats to NGO operations have been growing; therefore, the importance of tailoring security products to a region, town, village, or road is essential. NGOs require a greater understanding of an increasingly complex security environment as a means to ensure their own security. Intelligence provides both an immediate and long-term practical tool to enhance NGO security. 21 Many NGO directors complain about the volume of incident reports they receive and mention that they wish there was more focus on making relevant incidents (those that happened in the same locations as their field offices) more useful. In the field, the volume of information available and the many methods of encountering information are likely to overwhelm managers.40 The number of data sources is only limited by imagination and accessibility to the public and the internet. Managers will likely come to rely on trained personnel to process information for them.41 In fact, ANSO exists because unprocessed information abounds; what is required is greater analysis.42 Clearly, more than enough data exist for NGOs to create their own intelligence. To further illustrate the abundant data and the potential analytical power of academia, the author conducted a case study. 22 Classical intelligence analysis and social science research rarely meet, to the detriment of both intelligence and the social science community. The methods used within this study integrate the two by drawing on their individual strengths. In this case, qualitative methods were emphasized because they are an important means of gathering, analyzing, and interpreting data. Social science methods can add value to traditional intelligence analysis, while traditional intelligence methods preserve context. Both intelligence analysts and social scientists have much to gain through cooperation. What follows is an overview of the research methods used in this case study. 23 As Bob Glasser has asserted, “Grounded theory’s power and usefulness emerge in the realizations which come from doing.”43 Grounded theory, a qualitative approach, was used to complete a portion of this study and is here defined as theory generated from data.44 Adele Clarke’s interpretation of grounded theory in Situational Analysis: Grounded Theory after the Postmodern Turn provides the most suitable method for this study.45 Clarke takes this method and applies the data through a modified version of spatially integrated social science. 24 Grounded theory is used to develop a theory from the data. It is emergent, and since no theoretical models exist that address the study’s interests, it is a valid method. As mentioned, very little literature is written directly on this subject. Glasser stated that grounded theory is the best method to use “. . . where there is virtually no direct literature.”46 Further, the primary variables that address security incidents involving NGOs are not identified, making this study suitable for grounded theory. 25 The second portion of this study was conducted as an intelligence problem using a traditional intelligence method known as pattern wheel or pattern analysis plot sheet.47 The pattern wheel was used to exploit the themes articulated by the grounded theory approach. It visually highlights date and time in rings depicting days of the month and segments depicting hours of the day. Each sheet represents a separate year. The pattern wheel is adaptable and can be used for most time/space/event/group analyses. 26 The combined methods complement each other. 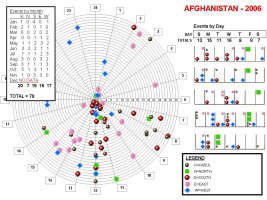 Clarke’s grounded theory method provided the mapping to reveal relationships between time, geography, attack types, and targets. Such data is required by the pattern wheel, which further refines and identifies any patterns or associations. 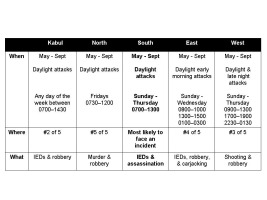 This helps to develop theory identifying safer times/locations of operation for NGOs. 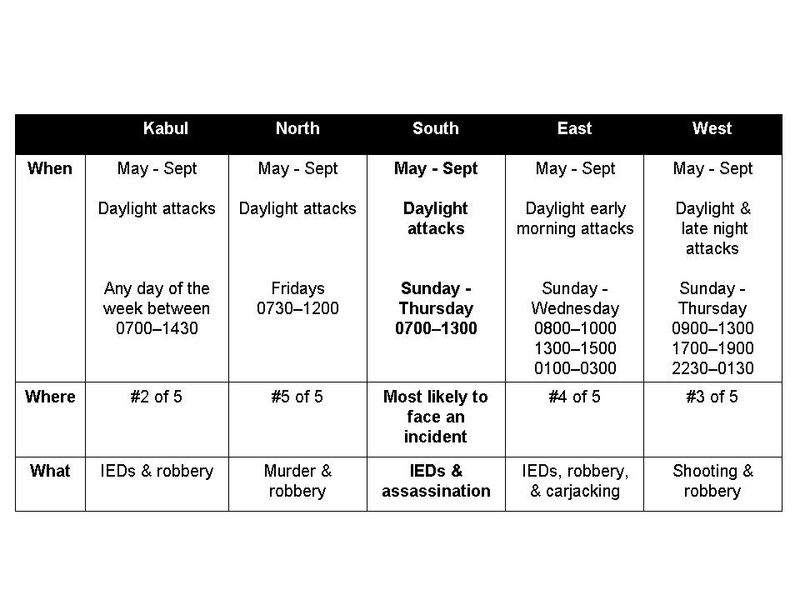 Understanding the cycles of violence in Afghanistan would provide NGOs the opportunity to avoid threats and increase their freedom of movement without compromising their security. 27 Rarely do intelligence analysts have all of the data or are even aware of all sources of data.48 Gaps in data are likely because trained intelligence personnel do not staff the reporting agency. As a result, it is probable the reporting agency failed to fully report, record, or exploit the data. 28 The findings of the study are summarized in Figure 1 and 2 and Table 1. From the findings, it is clear that attacks on NGOs are seasonal and occur on specific days of the week and times of the day. The data also provided the means of attacks and what the attackers’ objectives may have been, based on the type of security incident. From the data we see that location counts in security, as does proximity to government sites and activity. Importantly, the data indicates that, despite NGO claims of neutrality, the insurgency directly affects NGO insecurity. 29 Based on the data, open-source material can supply sufficient material to provide the basis for pattern analysis allowing for causal, qualitative, and, if desired, quantitative analysis. Understanding the operation environment, which includes weather, belligerents, and terrain, is critical if NGO insecurity in Afghanistan is to be improved. 30 NGO-driven intelligence obviously mates two of the three pillars of the Afghanistan Compact, namely security and socio-economic development. It provides the opportunity to share incident data, intelligence products, and to provide NGOs and other development staff the freedom of movement to visit villages and Afghan officials. In general, NGOs do not understand the intelligence that they need. 31 Government agencies and academe need to increase the capacity of NGOs to create their own security. Academics and NGOs share an individualistic nature that may provide academics with a non-intrusive entry point to increase NGO security. Due to organizational culture, military or government agencies may not be as well received as academics. Furthermore, the NGO concept of security is based on acceptance while the military concept of security is based on situational dominance. 32 Both NGOs and the Canadian Forces (CF) are unique subcultures. The organizational culture of NGOs has sometimes created mistrust or misunderstanding among the NGOs, the UN, and various international organizations, including NATO and, by extension, the International Security Assistance Force (ISAF). Understanding the culture, policies, and politics of NGOs adds context to the decisions and practices considered acceptable as well as those that are distasteful. Gaining support and cooperation among NGOs is vital for successful NGO-driven intelligence. Without input, there is little to analyze. 34 NGOs are driven to exceed expectations by donors, while the military must complete difficult tasks on order with little warning from their political masters. Military tasks originate from legitimate political masters. These same political masters dictate what constitutes acceptable military practices; conversely, NGOs derive acceptable practices internally and from their donor. 36 Since organizational culture counts, the form that intelligence takes within these NGOs is destined to be different from that of any national intelligence agency. A culture that resists an organized, centralized system poses unique opportunities and challenges in the creation of intelligence. Understanding the importance of organizational culture, an individualistic nature and the need for NGOs to distance themselves from government authority may provide academics with an entry point to enhance the analytic capability of NGO-driven intelligence. 37 Academia has a role to play in the creation of NGO-driven intelligence. Academic methods and studies in many of the social sciences may provide the basis of analysis for NGOs operating in insecure conflict zones. Intelligence is a sensitive subject and can be dangerous to produce. 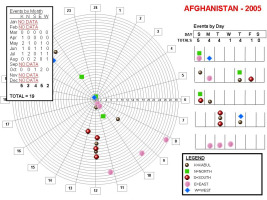 To avoid the danger of producing intelligence, the detailed analytical effort need not reside within Afghanistan. To preserve the context of data and increase the volume, NGOs might consider maintaining and reinforcing NGO intelligence focal points but conducting their analysis from remote locations. Information originating from the field could be forwarded to the focal point and onto another, safer remote location, such as a university or think tank. The focal point for intelligence collection would not have the burden, or danger, associated with the generation of intelligence. It would remove all threats associated with the generation of intelligence but be able to provide up-to-date assessments. 38 Currently, NGO security is based on the occasional field security assessment.54 This practice may impede security because it reduces the opportunity to include daily changes, which can be dynamic and might drastically alter NGO vulnerability. The inability to receive daily inputs, combined with the absence of a single security information database, impairs analysis. Furthermore, a lack of continuity and professional analysis means a clear understanding of the field situation is unlikely. NGOs are usually focused on core tasks such as supplying food, clean water, and medical support. A field-deployed NGO does not have the time, computing resources, training, or opportunity to generate intelligence even when assigned that task. The process of creating intelligence is specialist work that is complex and time- and resource-consuming, and there are dangers associated with the generation of intelligence that NGOs donors may not be willing to endure. 39 Leveraging and remotely exploiting data provided by NGOs would allow analysts and academics the freedom to provide high-quality causal, qualitative, and quantitative research products.55 Combinations of models and methods could result in effective intelligence. Regardless of the analytical tools used — whether causal mechanisms or qualitative or quantitative research methods — IT support is required. The opportunity to exploit data hidden within NGOs requires advanced training and computing power, neither of which is easily found in conflict zones, making remote data exploitation even more attractive. 41 Remote analysis may not be that difficult to establish once agreement among NGOs has been reached. A researcher with appropriate field experience, a research grant from the Social Sciences and Humanities Research Council, a reduced teaching load, and a small team of graduate students would provide a senior researcher all that is necessary to begin to increase the security of NGOs. Similar work has been undertaken at other universities that research human security. 42 Remote analysis is not perfect. The success of this concept is dependant on sustained agency buy-in, the development of a good governance structure, and the availability of accessible and effective technological solutions. 43 NGO-driven intelligence has many advantages, especially in Afghanistan, where it offers security and socio-economic development. It also enables NGOs to share incident data and provides them and other development staff with freedom of movement to operate among Afghans. The concept brings into play funding, resources, capabilities, and staff that have not been leveraged for NGO security to this point. 44 NGO insecurity can be mitigated through increased analysis of open-source data. Little theory exists regarding NGO insecurity; however, strands of evidence, based on basic pattern analyses conducted in this study, indicate that NGO-driven intelligence could significantly contribute to the safety of NGOs in Afghanistan. Unstructured data from NGO security-incident reports provided sufficient information to create basic intelligence. The study, without fully exploiting the data, clearly indicates that even limited open-source information could provide the means to create NGO-driven intelligence and assist NGOs in avoiding potential security incidents within Afghanistan. 45 Theory must be tentative in nature, making a grounded theory approach effective in this case. Grounded theory is emergent and is intended to provide an understanding of a researched situation. Few would disagree that insecurity in Afghanistan continues to evolve and requires constant study because insurgent tactics, techniques, and procedures (TTPs)57 also evolve; although ad hoc NGO mitigation practices are effective today, they may not be tomorrow. In the end, NGO mitigation practices, such as acceptance practices, will likely need to evolve to meet the challenges of NGO insecurity in Afghanistan. 46 NGOs remain vulnerable to criminality and insurgent activity and, as the literature illustrates, are increasingly identified with the government. Security incidents are increasingly violent, with improvised explosive devices (IEDs) becoming more common. Ultimately, humanitarian work is about action, not necessarily reason; however, actions without consideration for the operating environment will likely result in the undoing of all good works. 47 Intelligence is not the key to success in NGO operations; many successful NGO efforts have occurred without the benefit of intelligence. However, in increasingly unrestrained conflicts, NGO-driven intelligence, assisted by remote analysis provided by academia, may prevent the deaths of NGO personnel, and the loss of equipment and valuable aid. David T. MacLeod is a former infantryman, intelligence operator, and analyst and is currently a PhD Candidate at the University of New Brunswick. 1 . For the purposes of this article, NGOs are grouped into one catch-all category. While this grouping is expedient for this paper, it is incorrect because NGO values, concepts of operations, and specialties vary from one organization to another. Dorrothea Hilhorst, The Real World of NGOs: Discourses, Diversity and Development (New York: Zed Books, 2003), pp. 6-8. 2 . Lara Olson, “Fighting for humanitarian space: NGOs in Afghanistan,” Canadian Consortium on Human Security 5, no. 1 (2007), pp. 4–5, found at: www.humansecurity.info/vol51olson/4527476296 (accessed 10 January 2008). 3 . Gordon Smith, Canada in Afghanistan: Is it working? (Calgary, AB: Canadian Defence and Foreign Affairs Institute, 2007), p. 5. 4 . The term insurgent is liberally used and is broadly defined as any person or organization that rebels against established Islamic Republic of Afghanistan’s authority. Many insurgent groups operate in and around Afghanistan, the best known being the Taliban, but to define each group is beyond the scope of this article. 5 . According to Gregory F. Treverton, in Reshaping National Intelligence in an Age of Information (New York: Cambridge University Press, 2001), p. 93, open-source intelligence is generated from any information that is not deemed secret by government agency or law. Generally, the sources of information consist of reports from NGOs, relief agencies, UN organizations, blogs, websites, newspapers, magazines, news broadcasts, satellite imaging, observations by the local populace, and other freely obtained or purchased information. 6 . As described by Ryan Beasley, Cate Buchanan, and Robert Muggah in In the Line of Fire: Surveying the Perceptions of Humanitarian and Development Personnel of the Impacts of Small Arms and Light Weapons (2003), found at: www.odihpn.org/report.asp?ID=2584 (accessed 27 June 2006), p. 10, a security incident is an assault, robbery, intimidation, harassment, detention, kidnapping, or sexual violence. I have expanded the definition to include surveillance, stabbing, shooting, assassination, theft, carjacking, banditry, improvised explosive devices, hand grenades, and any other means used to physically or psychologically harm an NGO. 7 . Helmut Korak, “Information Sharing in Field Operations,” in Sheryl Brown, ed., Launching SIRS: The Safety Information Reporting Service, Proceedings of the Conference on Crisis Management and Information Technology held in Saint Paul de Vence, 11–14 December 2005 (Washington, DC: United States Institute of Peace, 2005), p. 32. 8 . Steven Marrin, “Intelligence Analysis Theory: Explaining and Predicting Analytic Responsibilities,” Intelligence and National Security 22, no. 6 (2007), pp. 821–46. 9 . Bassey Ekpe, “The Intelligence Assets of the UN: Sources, methods, and implications,” International Journal of Intelligence and Counter Intelligence 20, no. 3 (2007), pp. 377–400. 10 . Melissa Ong and Bob Schmitt, “Fact Finding Trip to Afghanistan and Indonesia,” SIRS Field Assessment Report (Washington, DC: United States Institute of Peace, 2005), p. 7. 11 . Abby Stoddard, Adele Harmer, and Katherine Haver, Providing Aid in Insecure Environments: Trends in Policy and Operations (London: Overseas Development Institute, 2006), found at: www.cic.nyu.edu/internationalsecurity/docs/aidworkers_final.pdf (accessed October 2006), p. 5. 12 . Farahnaz Karim, Humanitarian Action in the New Security Environment: Policy and Operational Implications in Afghanistan (London: Overseas Development Institute, 2006), found at: www.odi.org.uk/HPG/papers/BGP_InsecurityAfghanistan.pdf (accessed October 2006), p. 31. 13 . John Godges, “Afghanistan on the Edge: A World at Risk of Winning the Urban Battle, Losing the Rural War, Abandoning the Regional Solution,” RAND Review 31, no. 2 (2007), pp. 14–21. 15 . Freedom of Movement is a concept that alludes to human rights; however, in this case it refers to the freedom of an NGO to travel to locations where their services may be required. Essentially freedom of movement allows NGOs to operate wherever they are welcomed or accepted within civil society. Violence against NGOs limits their freedom of movement. 16 . Robert MacPherson, CARE International Safety and Security Handbook (London: Cooperative for Assistance and Relief Everywhere, 2004), p. iv. 17 . David Kilcullen, “Three Pillars of Counterinsurgency,” Remarks delivered at the US Government Counterinsurgency Conference, Washington DC, 28 September 2006, p. 1. 18 . Frank Hoffman, Conflict in the 21st Century: The Rise of Hybrid Wars (Arlington, VA: The Potomac Institute for Foreign Policy Studies, 2008), p. 29. 19 . Michael Evans, “From Kadesh to Kandahar,” Naval War College Review LVI, no. 3 (Summer 2003), p. 133. 20 . Afghanistan NGO Safety Office (ANSO) and CARE, NGO Insecurity in Afghanistan (London: CARE, 2005), found at: http://www.care.org/newsroom/specialreports/afghanistan/20050505_ansocare.pdf (accessed October 2006), p. 2. 21 . Islamic Republic of Afghanistan (IRA), Ministry of Rural Rehabilitation and Development (MRRD) Monthly Program Report: Asad 1388 (22 July to 22 August 2009), National Solidarity Program (NSP), found at: http://www.nspafghanistan.org/reports_and_publications/monthly_reports/2009-08-Program%20Report-August%2009%20(Asad%201388).doc (accessed 20 September 2009), p. 4. 22 . Neo-medievalism is characterized by overlapping institutional jurisdictions; increasingly permeable borders; extreme wealth disparity; rapid growth of marginalized populations; multiple political, corporate, ethnic, tribal, criminal, and religious loyalties; uncontrolled urbanization; increased urban disorder; and spread of lawlessness. Mark Duffield, “Post-modern Conflict: Warlords, Post-Adjustment States and Private Protection,” Civil Wars 1, no. 1 (1998 Spring), pp. 65–102. 23 . David Galula, Counterinsurgency Warfare: Theory and Practice (Westport, CT: Praeger, 1964), p. 81. 24 . For instance, Canada pledged CA$800 million to reconstruction in Afghanistan; multilateral institutions and NGOs distributed most of the aid. Matt Waldman, Falling Short: Aid Effectiveness in Afghanistan, ACBAR Advocacy Series (2008), p. 9. 25 . Abby Stoddard, Adele Harmer, and Katherine Haver, Providing Aid in Insecure Environments: Trends in Policy and Operations (London: Overseas Development Institute, 2006), found at: www.cic.nyu.edu/internationalsecurity/docs/aidworkers_final.pdf (accessed October 2006), p. 28. 26 . Martin Ewans makes a series of cases for this argument throughout his book. He refers to the successive invasions by empires, including the Greek, Persian, Mongol, British, and Russian, and how the Pashtuns have endured each. Martin Ewans, Afghanistan: A Short History of its People and Politics (New York: HarperCollins, 2002). 27 . Antonio Giustozzi, Koran, Kalashnikov, and Laptop: The Neo-Taliban Insurgency in Afghanistan (New York: Columbia University Press, 2008), p. 105. 28 . Sippi Azarbaijani-Moghaddam, Mirwais Wardak, Idrees Zaman, and Annabel Taylor, Afghan Hearts, Afghan Minds: Exploring Afghan Perceptions of Civil-Military Relations (Kabul: BAAG & ENNA, 2008), p. 69. 29 . Giustozzi, A. Koran, Kalashnikov, and Laptop, pp. 105-07. 30 . European Commission Humanitarian Aid (ECHO), Report on Security of Humanitarian Personnel: Standards and Practices for the Security of Humanitarian Personnel and Advocacy for Humanitarian Space (2004), found at: www.reliefweb.int/rw/lib.nsf/db900sid/LHON-66VEC8/$file/security _report_echo_2004.pdf (accessed September 2006), pp. 22-24. 31 . Koenraad van Brabant, Operational Security Management in Violent Environments: A Field Manual for Aid Agencies (London: Overseas Development Institute, Humanitarian Practice Network, Good Practice Review No. 8, 2000), found at: www.odihpn.org.uk (accessed 15 October 2006), p. 248. 32 . Kim Rossmo, Geographic Profiling (Boca Raton, FL: CRC Press, 2000), p. iii. 33 . Afghanistan NGO Safety Office (ANSO), ANSO Quarterly Data Report (Q.2-07) December 22nd, 2006-June 30th, 2007 (Kabul: European Commission Humanitarian Aid, Deutsche Welthunger Hilfe, 2007), found at: http://images.derstandard.at/20071106/ANSO_Report_Q207.pdf (accessed September 2007), p. 3. 34 . David Carment, Stewart Prest, and Yiagadeesen Samy, Security, Development, and the Fragile State: Bridging the Gap Between Theory and Policy (New York: Routledge, 2010), p. 139. 35 . David Carment, Martin Rudner, and Rachel Lea Heide, “Peacekeeping Intelligence: Extending Partnerships and Boundaries for Peacekeeping,” in David Carment and Martin Rudner, eds. Peacekeeping Intelligence: New Players, Extended Boundaries (New York: Routledge, 2003), pp. 1–14. 36 . ANSO conducts many functions, including coordination functions and collection and dissemination of information on the security environment. Dissemination occurs through security incident and situation reports. ANSO constructs its reports through the collection and basic analysis of unstructured data. Vincenzo Bolletino, Designing Security (Cambridge, MA: Harvard University, 2006), found at: www.hpcr.org/pdfs/DesigningSecurity.pdf (accessed 26 December 2006). 37 . NGO Insecurity in Afghanistan, pp. 2-4. 39 . Afghanistan NGO Safety Office (ANSO), ANSO Quarterly Data Report (Q.2-09) Jan 01-Jun 30 2009 (Kabul: European Commission Humanitarian Aid, Deutsche Welthunger Hilfe, 2009), found at: http://www.afgnso.org/2009/ANSO%20Q.2%202009.pdf (accessed September 2009), p. 6. 40 . Treverton, Reshaping National Intelligence, p. 115. 43 . Bob Glasser, Doing Grounded Theory: Issues and Discussions (Mill Valley, CA: Sociology Press, 1998), p. 2. 44 . John W. Creswell, Qualitative Inquiry and Research Design: Choosing Among the Five Approaches (Thousand Oaks, CA: Sage, 2007), p. 63. 45 . Adele E. Clarke, Situational Analysis: Grounded Theory After the Postmodern Turn (Thousand Oaks, CA: Sage, 2005). 46 . Glasser, Doing Grounded Theory, p. 120. 47 . United States Army, US Army & Marine Corps Counter Insurgency Field Manual (Chicago: The University of Chicago Press, 2007), p. B-60. 48 . Cynthia Grabo, Anticipating Surprise: Analysis for Strategic Warning (Lanham, MD: University Press of America, 2004), pp. 9-11. 49 . Melinda Hofstetter, Cross-Cultural Relations Between Civilian and Military Organizations (Washington, DC: Tulane University, Centre for Disaster Management and Humanitarian Assistance, 2003) (accessed September 2008). 50 . Francis Kofi Abiew, From Civil Strife to Civic Society: NGO-Military Cooperation in Peace Operations OCCASIONAL PAPER No. 39 (Ottawa: Carleton University, Norman Patterson School of International Relations, 2003), found at: http://www.pdtglobal.org/EIPdata/Library/Analysis%20and%20Reform%20of%20Peacekeeping%20Operations/CivMil%20and%20NGOs.pdf (accessed October 2006). 51 . Report on Security of Humanitarian Personnel. 52 . OXFAM, Iraq: Humanitarian Military Relations (London: OXFAM, 2003), p. 3. 53 . European Commission Humanitarian Aid (ECHO), NGO Security Collaboration Guide, found at: www.beredskabskurser.dk/OEMC1/SMC/I%20C%20EC%20ECHO/04b.pdf (accessed January 2007). 54 . Bolletino, Designing Security. 55 . Jack A. Goldstone, Using Quantitative and Qualitative Models to Forecast Instability (Washington, DC: United States Institute for Peace, 2008), found at: www.usip.org/pubs/specialreports/sr204.pdf (accessed September 2008). 56 . Using historical examples, Grabo argues that intelligence is challenged by many conflicting and unethical pressures when supporting policy makers. Although her arguments are based on the US government, many of the concepts hold true for any organization. Anticipating Surprise: Analysis for Strategic Warning. 57 . Insurgent and criminal activity vary and evolve. Criminals may be opportunists without a single modus operandi. The varied motivations, combat experience, and leadership of any criminal group make anticipating the practices of criminals difficult. However, criminals have been known to re-use methods that have been successful in the past. For example, there may be a series of carjackings until locals and NGOs take action that thwarts attacks. Conversely, insurgents are taught tactics, techniques, and procedures (TTPs) that have been field-proven elsewhere. These proven TTPs will evolve as they are defeated or countermeasures are taken.